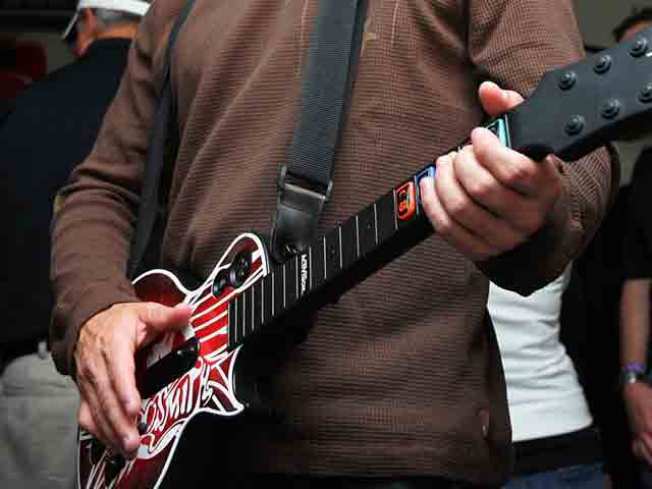 Become a real rock star with your videogame gadgets. Now you can play actual music on your Guitar Hero guitar -- for Free! This is so much fun and it's such a total hit among the neighborhood kids that we decided to take a departure from our "gadget" in Gadget Friday to take a look at free software that will turn your Guitar Hero or Rock Band plastic guitar into a real musical instrument. If you're experienced with computers and you're good at following instructions, you can have this up and running in less than 15 minutes. If installing software or dealing with your computer's file folders is beyond you, you may need a teenager's help. 1. A guitar from the game Guitar Hero or Rock Band. Ideally, it should be from the Xbox360 version, because they have the easy to use USB connectors. If you're trying to use one from a Playstation game, you will need an Playstation-to-USB adapter. Here's more information about adapters. 2. A computer. Either one -- PC or Mac. It doesn't matter. Go to The Guitar Heros Web site, where you will find an actual band that plays Guitar Hero guitars live on stage! I promise if you follow the exact instructions, you'll be rocking in no time. For a great article about the band "Guitar Zeros" and instructions on how to make other weird instruments, check out the latest issue of Make Magazine.